Mr Blair is calling an election, but what choice do we have? The percentage of people voting falls each year as the main parties become ever more similar in their bid to woo middle England. Leaving the general public with a choice of lots of the same thing. Increasingly the governments agenda seems to represent business and corporate gain before human concerns, it promotes war in the name of peace? It takes away our rights and forces us to give up our freedoms in the name of freedom. Protest will soon be banned anywhere within earshot of the government, and we are told it is for our own safety. Ladies and Gentlemen it will not do! Over 600 letters were handed to the House Of Commons on Monday April 4th, challenging every Labour, Conservative and Liberal Democrat MP to a game of cricket over their lack of honour and morals. A few days before the match we received this legal challenge from the GLA (Greater London Authority). 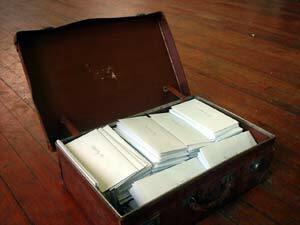 However an activist superstar lawyer came to our aid and discovered a way around their letter. 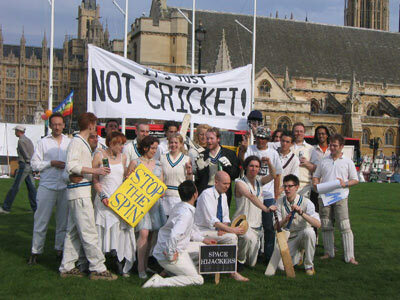 Mainly due to the fact that this was a cricket match and not a protest. The match went ahead as planned. We recieved a fair amount of press before the match with mentions on XFM and articles in the London Line and the Guardian amongst other things. "A decline of our challenge will be seen by us and the entire British Public as acceptance that you are the morally and honourably corrupt government that we suspect. We shall see you at the pitch."